So, as my makeup shopping behaviour got a bit out of hand lately, I decided it was time to do something about it! At first I just thought of putting myself on a spending diet, but Tali @The Gloss Goss and Fantastic @Suka & Spice had a better idea for me: to join in on a round of Project 5 Pan, which (as you already know) basically means not buying any new makeup until hitting pan or finishing 5 makeup items in our collection. - the finished products will be photographed at the end of the project. At this point, I 'm not that optimistic, even though P 5 P is much more manageable than P 10 P.
I haven't bought anything from Naked Honey or Colour Craft (I must be the only one, lol, but sticking to my goal at the moment), however I won't be able to resist to Style Black, so any project around that time, would be a definite failure! Luckily I still have some things coming through the mail, so at least I will have something to keep me busy makeup-wise! I 'm encouraging everyone reading this to join in on Project 5 Pan! Yay! You're IN! 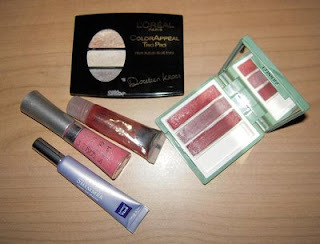 Yknow, one of the lip products I'm trying to finish is that diamond shine gloss as well! When that Black collection comes out, I'm going to need to be done as well *re-applying gloss,in preparation to cook dinner× I'm hopeless at this! That lipgloss seems to have a lot more product than it looks, huh? It's the first item I 'm trying to finish, and still looks the same to me! @Halifax: Oh, cool! Well I figured if I still really really want some items after P5P, I can always get them later! (I would ask you to finish up sth and send me the empty packaging, but that would be cheating, RIGHT???)!! !